Resonant controllers are used in power converter voltage and current control due to their simplicity and accuracy. However, digital implementation of resonant controllers introduces problems related to zero and pole mapping from the continuous to the discrete time domain. Namely, some discretization methods introduce significant errors in the digital controller resonant frequency, resulting in the loss of the asymptotic AC reference tracking, especially at high resonant frequencies. The delay compensation typical for resonant controllers can also be compromised. Based on the existing analysis, it can be concluded that the Tustin discretization with frequency prewarping represents a preferable choice from the point of view of the resonant frequency accuracy. However, this discretization method has a shortcoming in applications that require real-time frequency adaptation, since complex trigonometric evaluation is required for each frequency change. In order to overcome this problem, in this paper the modified Tustin discretization method is proposed based on the Taylor series approximation of the frequency prewarping function. By comparing the novel discretization method with commonly used two-integrator-based proportional-resonant (PR) digital controllers, it is shown that the resulting digital controller resonant frequency and time delay compensation errors are significantly reduced for the novel controller. D. G. Holmes, B. P. McGrath, and S. G. Parker, "Current regulation strategies for vector-controlled induction motor drives," Industrial Electronics, IEEE Transactions on, vol. 59, pp. 3680-3689, 2012. A. G. Yepes, F. D. Freijedo, J. Doval-Gandoy, O. Lopez, J. Malvar, and P. Fernandez-Comesa, "On the discrete-time implementation of resonant controllers for active power filters," in Industrial Electronics, 2009 (IECON'09). 35th Annual Conference of IEEE, 2009, pp. 3686-3691. L. Asiminoaei, F. Blaabjerg, S. Hansen, and P. Thogersen, "Adaptive compensation of reactive power with shunt active power filters," Industry Applications, IEEE Transactions on, vol. 44, pp. 867-877, 2008. A. D. Aquila, M. Liserre, V. G. Monopoli, and P. Rotondo, "Overview of PI-based solutions for the control of DC buses of a single-phase H-bridge multilevel active rectifier," Industry Applications, IEEE Transactions on, vol. 44, pp. 857-866, 2008. A. Timbus, M. Liserre, R. Teodorescu, P. Rodriguez, and F. Blaabjerg, "Evaluation of current controllers for distributed power generation systems," Power Electronics, IEEE Transactions on, vol. 24, pp. 654-664, 2009. Y. W. Li, F. Blaabjerg, D. M. Vilathgamuwa, and P. C. Loh, "Design and comparison of high performance stationary-frame controllers for DVR implementation," Power Electronics, IEEE Transactions on, vol. 22, pp. 602-612, 2007. S.-Y. Park, C.-L. Chen, and J.-S. J. Lai, "A wide-range active and reactive power flow controller for a solid oxide fuel cell power conditioning system," Power Electronics, IEEE Transactions on, vol. 23, pp. 2703-2709, 2008. S.-Y. Park, C.-L. Chen, J.-S. Lai, and S.-R. Moon, "Admittance compensation in current loop control for a grid-tie LCL fuel cell inverter," Power Electronics, IEEE Transactions on, vol. 23, pp. 1716-1723, 2008. R. Cárdenas, C. Juri, R. Peña, P. Wheeler, and J. Clare, "The application of resonant controllers to four-leg matrix converters feeding unbalanced or nonlinear loads," Power Electronics, IEEE Transactions on, vol. 27, pp. 1120-1129, 2012. G. Bergna, J. A. Suul, E. Berne, P. Egrot, P. Lefranc, J.-C. Vannier, et al., "Mitigating DC-side power oscillations and negative sequence load currents in modular multilevel converters under unbalanced faults-first approach using resonant PI," in 38th Annual Conference on IEEE Industrial Electronics Society (IECON 2012), 2012, pp. 537-542. F. Rodriguez, E. Bueno, M. Aredes, L. Rolim, F. A. Neves, and M. C. Cavalcanti, "Discrete-time implementation of second order generalized integrators for grid converters," in Industrial Electronics, 2008 (IECON 2008). 34th Annual Conference of IEEE, 2008, pp. 176-181. 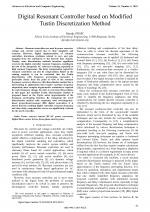 R. Teodorescu, F. Blaabjerg, U. Borup, and M. Liserre, "A new control structure for grid-connected LCL PV inverters with zero steady-state error and selective harmonic compensation," in Applied Power Electronics Conference and Exposition, 2004 (APEC '04). Nineteenth Annual IEEE, 2004, pp. 580-586. D. Luczak, "Tunable digital filter structures for resonant frequency effect reduction in direct drive," in Communication Systems, Networks & Digital Signal Processing (CSNDSP), 2012, 8th International Symposium on, 2012, pp. 1-6. S. A. Khajehoddin, M. Karimi-Ghartemani, P. K. Jain, and A. Bakhshai, "A resonant controller with high structural robustness for fixed-point digital implementations," Power Electronics, IEEE Transactions on, vol. 27, pp. 3352-3362, 2012. A. G. Yepes, F. D. Freijedo, O. López, and J. Doval-Gandoy, "High-performance digital resonant controllers implemented with two integrators," Power Electronics, IEEE Transactions on, vol. 26, pp. 563-576, 2011. M. J. Newman and D. G. Holmes, "Delta operator digital filters for high performance inverter applications," Power Electronics, IEEE Transactions on, vol. 18, pp. 447-454, 2003. R. Teodorescu, F. Blaabjerg, M. Liserre, and P. C. Loh, "Proportional-resonant controllers and filters for grid-connected voltage-source converters," in Electric Power Applications, IEE Proceedings, 2006, pp. 750-762. L. Harnefors, "Implementation of resonant controllers and filters in fixed-point arithmetic," Industrial Electronics, IEEE Transactions on, vol. 56, pp. 1273-1281, 2009. A. G. Yepes, F. D. Freijedo, J. Doval-Gandoy, O. Lopez, J. Malvar, and P. Fernandez-Comesa, "Effects of discretization methods on the performance of resonant controllers," Power Electronics, IEEE Transactions on, vol. 25, pp. 1692-1712, 2010. C. P. Ion and C. Marinescu, "Autonomous Three-Phase Induction Generator Supplying Unbalanced Loads," Advances in Electrical and Computer Engineering, vol. 13, pp. 85-90, 2013. 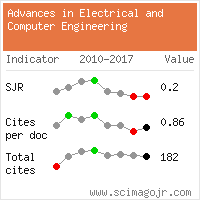 Citations for references updated on 2019-04-22 02:52 in 137 seconds. Website conception, design and maintenance by Eugen COCA. Content updated on 28 Feb 2019. Site engine updated on 28 Feb 2019. This page was generated on the server in 0.063 seconds and loaded in your browser in > seconds.